Summer is on its way and festivity is filling the air. Yep, we love November! We’re pretty sure you will too, once you get a load of all the awesome things you can do this month. We don’t know about you, but over 100 independent art and design stalls winding their way through the beautiful Old Museum Building sounds pretty good to us. The Finders Keepers Markets are a glorious celebration of the creativity surging through Brisbane, as well as a few special guests from further afield. This year’s favourites include Dear Mabel Handmade, Studio Cockatoo and Timber & Co., with exciting debuts from Ingo, Mary Bobbin and The Eclectic Candle Co. Then, of course, there’s all the food, live music and specialty beverage stalls to investigate, so it’s certainly worth your $2 entry fee! Colourful costumes, an ocean of vendors and all the nerdy goodness you can handle? Yep, that sounds good to us! The Supanova Pop Culture Expo is a firm favourite for thousands of genre fans across the country, and November’s Brisbane dates are looking very tasty indeed. Guests include actors Jason Mewes (snootchie bootchies! ), Michelle Gomez and Claudia Wells, as well as Futurama stars John DiMaggio and Billy West. Compete in the anime trivia contest, marvel at the cosplay superstars and swing by The Imagineer’s Playground for a wealth of artistic workshops and demonstrations. Everyone deserves to be warm, well fed and comfy at Christmas time, and we’re not just talking about our fellow humans. There’s a lot of animals without loving homes in Brisbane, and the RSPCA needs our help to make sure as many of them are looked after as possible. That’s where the RSPCA Santa Paws & Christmas Markets comes in! 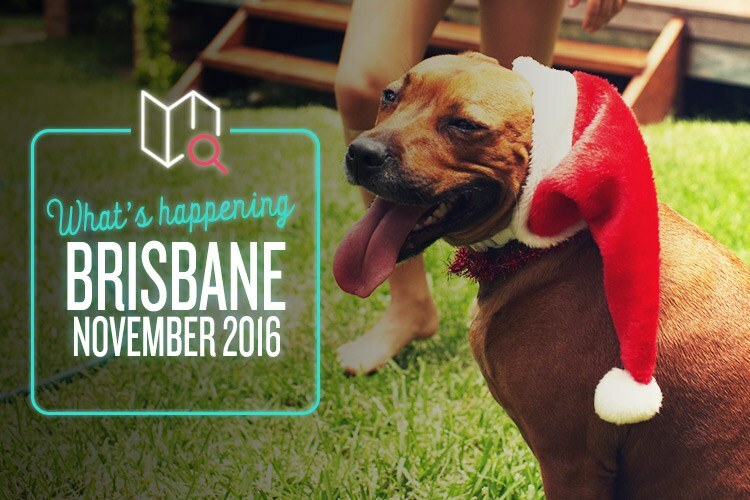 Grab your doggie and head down to Wacol Animal Care Campus for a weekend of festive fun, including pictures with Santa and a host of stalls to browse for special gifts. It’s a paw-esome experience for everyone, and it’s all for a noble cause. Nothing hails warm weather and good times like a kickass music festival, and Bulimba has a doozy in store for us this year. The line-up is tantalising, featuring dance maestros Northeast Party House, retro rock outfit The Delta Riggs, and Brisbane’s own up-and-coming garage pop revivalists The Jensens. Aside from the tunes, there’s also a ton of street performers, vendor stalls and food trucks, not to mention beer courtesy of Newstead Brewing Co., Monteith’s Brewing Co. and Stone & Wood. Now that’s a day out!